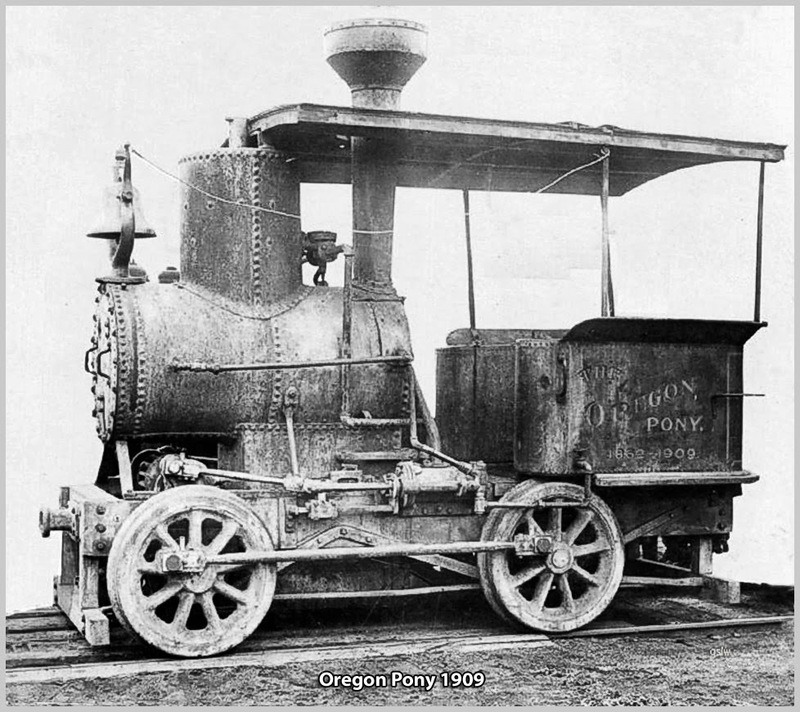 Oil-Electric: Rails to Trails - Part 2: To Market to Market! 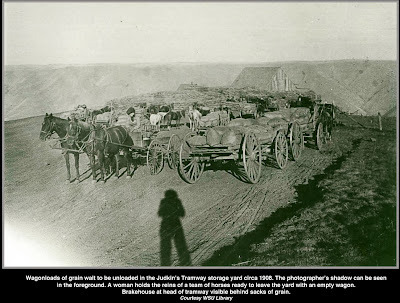 By 1890 nearly all the Palouse lands had been taken up and converted to wheat, pea. Lentil, and other dry farming crops. 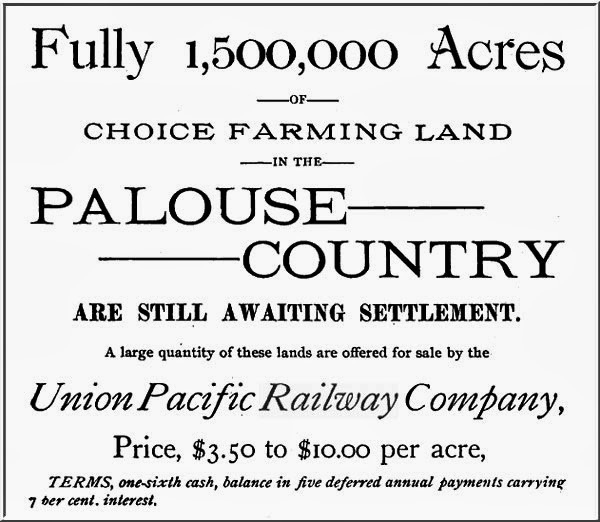 "The repute of the Palouse development grabs the attention of international markets. 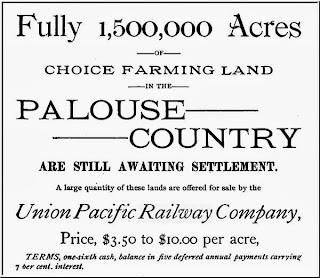 Names Walla Walla, Palouse, Colfax, was uttered on the commodity exchanges in Liverpool and Europe. "In 1903 the estimate of the chief of the United States Bureau of Statistics of the Department of Agriculture was 14.4 bushels per acre for the wheat yield of the entire country. For the states of Oregon, Washington and Idaho the average was 21.2 bushels per acre, nearly 48 per cent higher than for the country as a whole. "Then, again, Inland Empire wheat weighs too much that it is next to impossible to find any sufficiently light [weight] to grade as "No. 1. "While in the wheat sections of the Middle West the farmer counts himself fortunate who can raise a crop that is good enough to get into the "No. 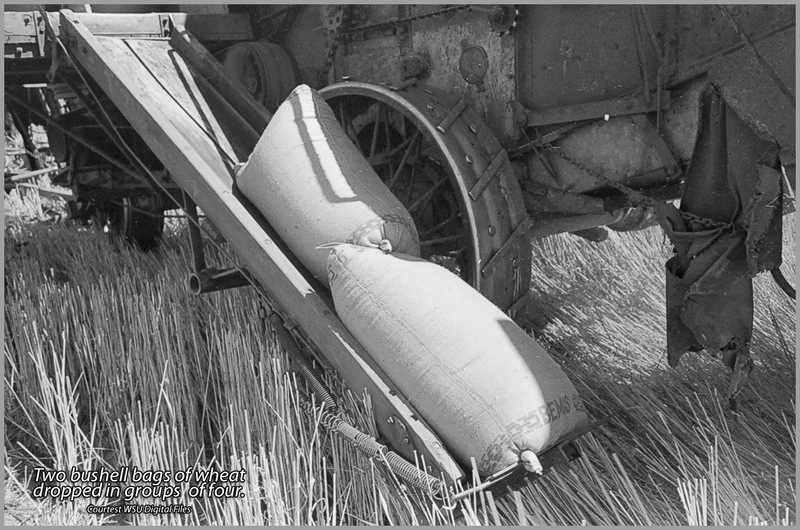 1" classification, 58 pounds per bushel, Inland Empire wheat averages from 59 to 65½ pounds per bushel. 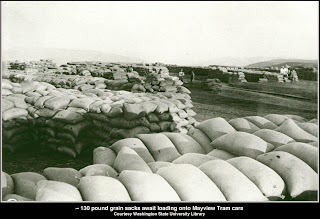 "In Minnesota a sack of wheat weighs on an average of about 115 pounds; in the Inland Empire, in 1903, it tipped the scale at about 130 pounds. 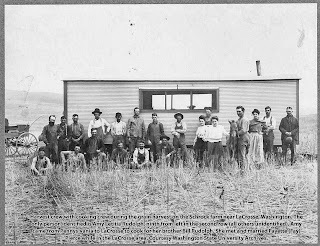 • "There had never been anything like a complete crop failure since the first settler arrived. • Grain is sown in the autumn, about the time the rains begin; remains in the ground during the period of greatest precipitation (usually in the form of snow); matures and ripens with the decreasing rainfall of early spring and summer, and is harvested from July to December, the driest part of the year. • With a rainfall of twenty inches, a yield of 40 bushels to the acre is an ordinary thing, while 50, 60 and 70 [bushels] are often grown. Spring wheat, under favorable conditions, yields from 20 to 30 bushels per acre. 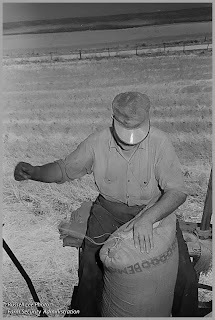 • The cost of wheat production in the Inland Empire is relatively so much less and the yield so far ahead of many much advertised …that those who have not visited the region often discredit actual returns from harvest fields. o Average yield of wheat for United States is about 15 bushels per acre. • Yield in the Red River Valley, North Dakota, is from 5 to 35 bushels per acre. • Yield in the Inland Empire, 40 to 68 bushels per acre. 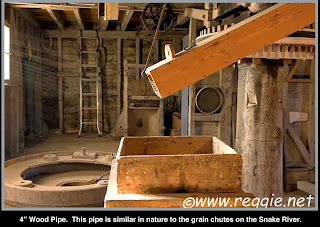 • Oats, barley, flax and rye are also grown in large quantities and in a profitable manner. 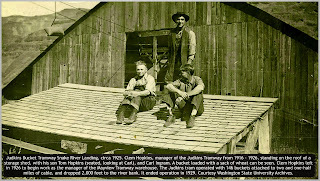 The profit of wheat-raising in Oregon, Washington and Idaho was readily seen." People could not profit from such abundance, however, unless they could ship their crops to market. 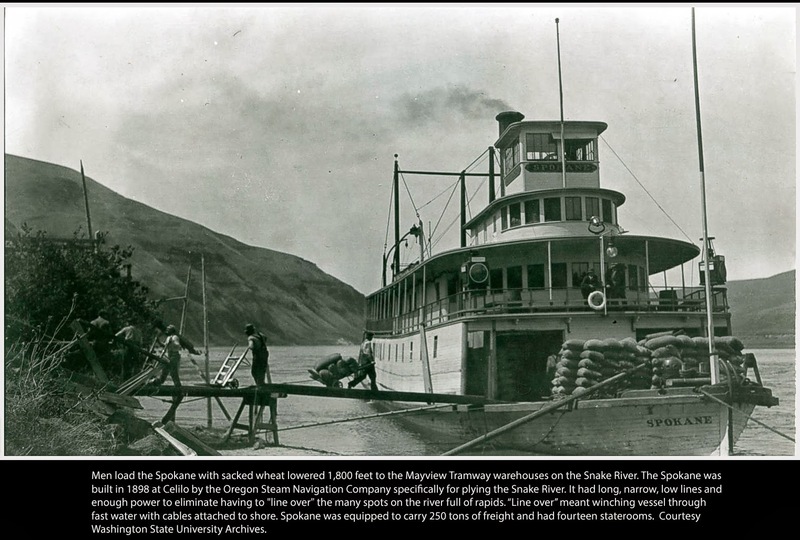 Before the arrival of the railroads in the 1880s, the only route out was by steamboat via the Clearwater, Snake and Columbia Rivers. 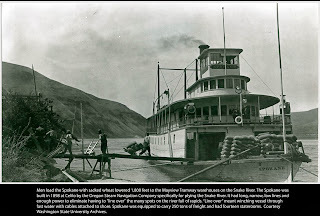 And there were the added bottlenecks at Celilo Falls (The Dalles) and Cascade Rapids, now Cascade Locks, around which the sacks of wheat had to be unloaded a sack at a time, loaded onto rail cars, transported via wagon portage, and then loaded back on to river steamboat, to continue to Portland Oregon. The demand for this portage railroad in fact became the first railroad in Oregon! 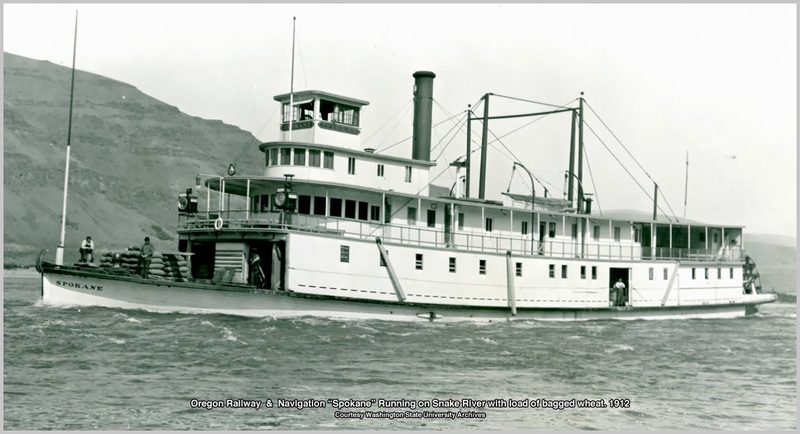 This "Oregon Pony" was one of three placed into service, moving not only wheat, but passengers and freight around the rapids. And while river transport was a challenge, the real challenge came in transporting the wheat down to the river bank! The simplest solution was an exhausting and dangerous scramble down from the canyon rim by horse and wagon. Sometimes drivers tied logs or brush behind their rig to slow their descent. 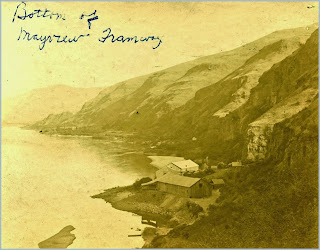 The roads themselves contained many switchbacks, and in some places imaginative farmers constructed turntables allowing wagons and teams to negotiate sharp corners. On the left, in blue, is what became known as the Spiral Highway. 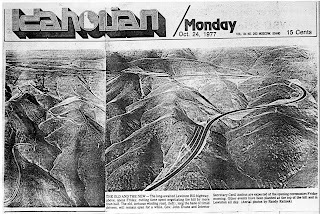 We students from WSU referred to it as the Lewiston Grade. 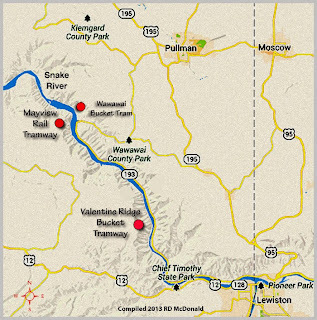 Idaho Department of Transportation (IDT), refers to the route as US 195 or 5 Mile Hill. This was the last leg from Genesse Idaho down to the Clearwater River at Lewiston Idaho. The paved 0highway, completed in 1917, followed the original ungraded wagon trail. 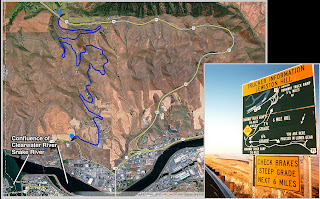 It is nine and a half miles long, average gradient 4%. 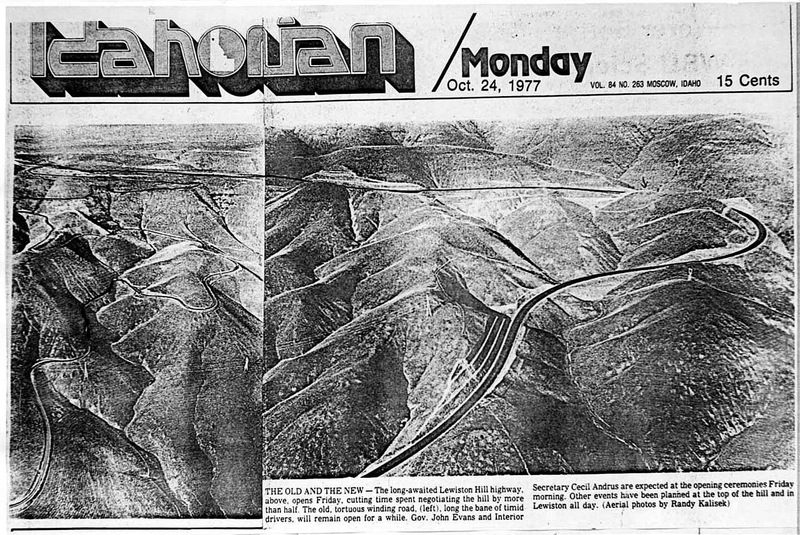 On October 28, 1977, the much-simplified "dog leg" alignment was opened to the public. 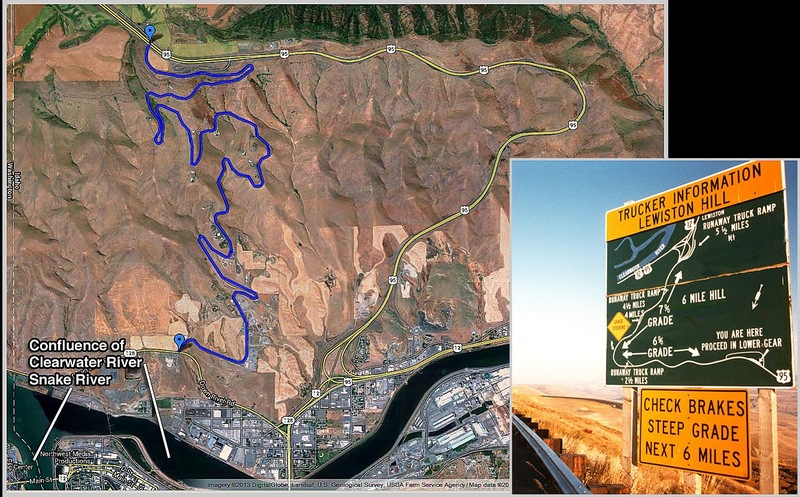 It chops nearly four miles off the descent down 5 Mile Hill but with an added risk; 2½ miles of 6% grade, followed by 4½ miles of 7% grade! With 5 truck escape ramps! But this was no way to get huge crops to market! 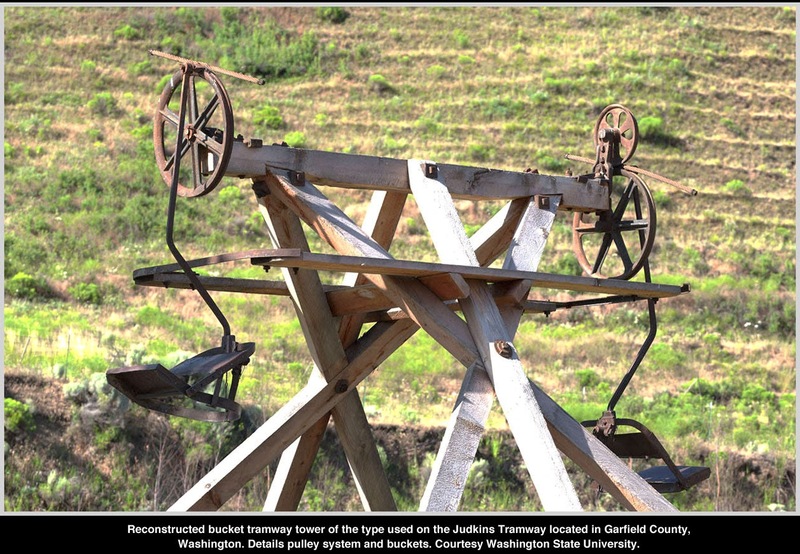 Inventive settlers searched for other methods of transporting the crop, coming up with logical solutions such as chutes and tramways. 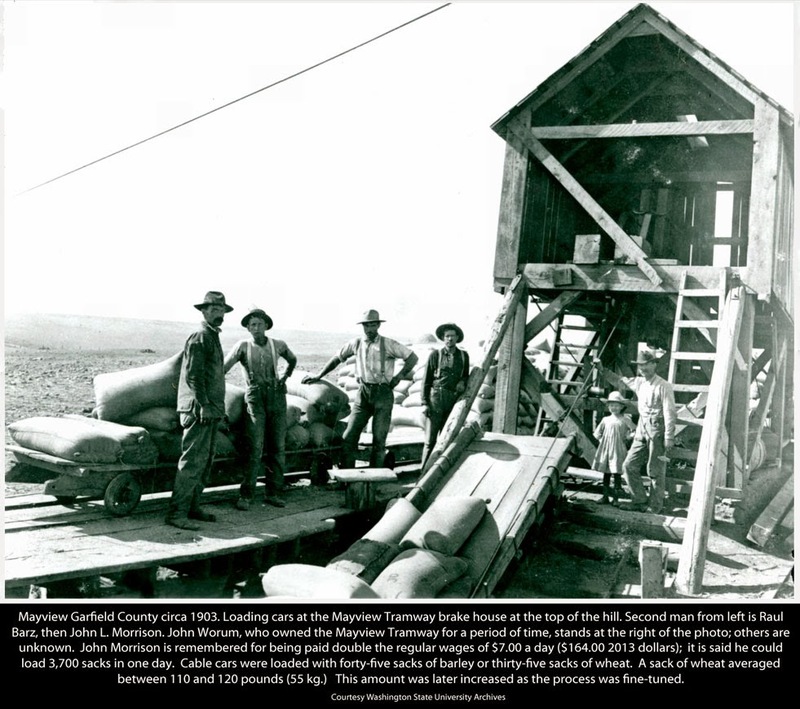 The first grain chute was a four-inch-square wooden pipe, 3,200 feet long, constructed on the Snake River's southern wall at Moxwai (now Knoxway) Canyon in 1879 in what is now Garfield County. 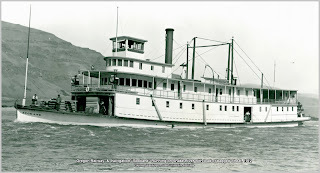 It was designed and built by local settler and entrepreneur Major Sewell Truax. The Majors effort hardly became an instant success. It was labor intensive, and toasted the wheat! 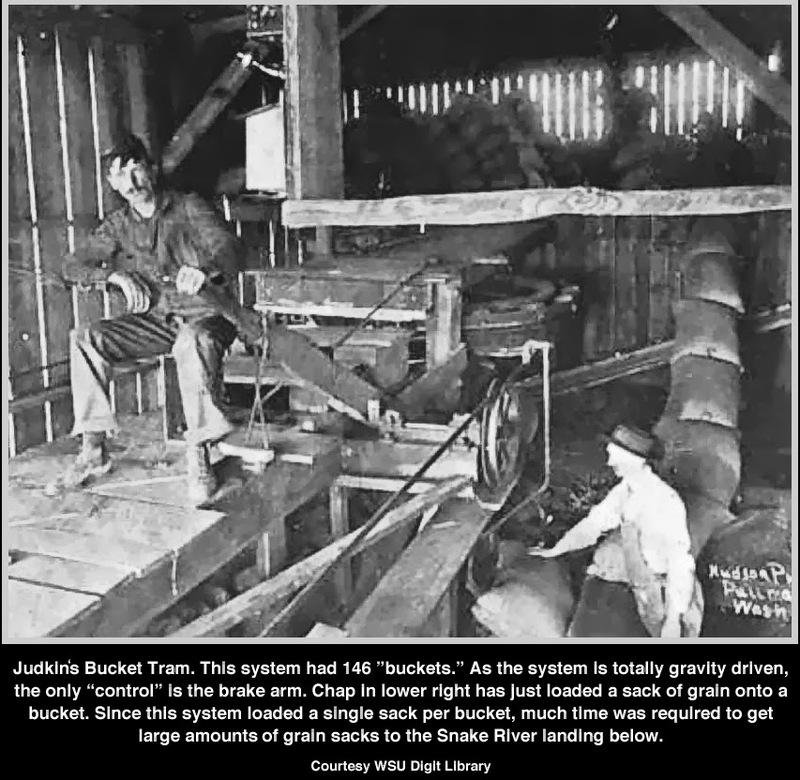 At the top of the chute, workers had to un-sack the wheat that had been sacked aboard the combine, pour it into the four-inch square pipe, and then re-sack the wheat at the bottom of the chute. It was time consuming and hazardous. 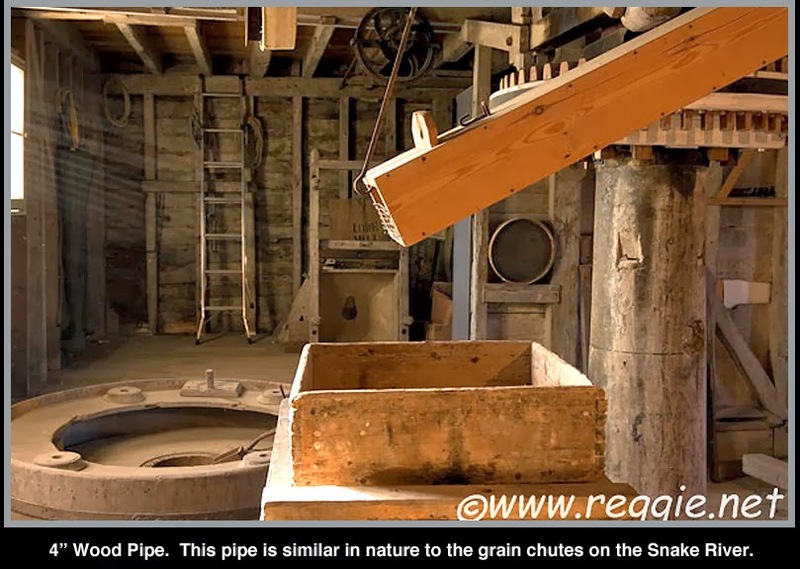 Passage of grain was as though the pipe was though sand blasting the pipe! 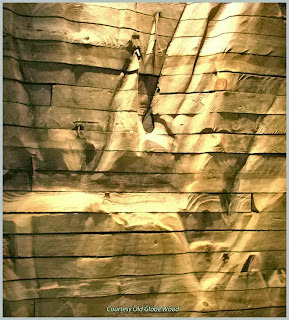 This section of wall was taken from the demolition of Globe Elevator in Superior Wisconsin. 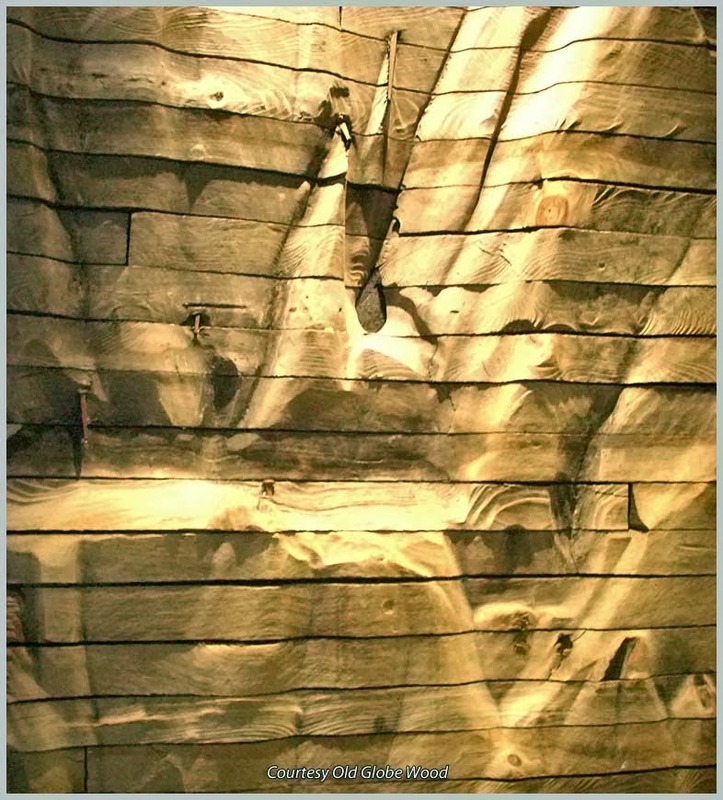 Scenes of the reclaiming of old timber was featured on Discovery's "Ax Men" some time back. Truax installed novel approaches, such as baffles, which slowed the descent. However, the "fix" created the chute to clog. Primitive though it was, Truax's device proved more efficient than hauling wheat downhill by wagon, and within a few years other chutes lined both sides of the river. 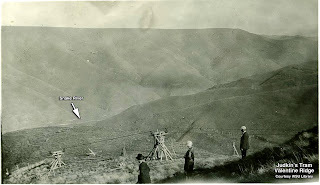 There may have been other locations, which are now lost to history. 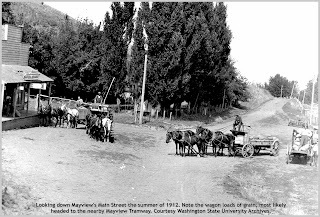 Tramways were an alternative to wagon road or chute. 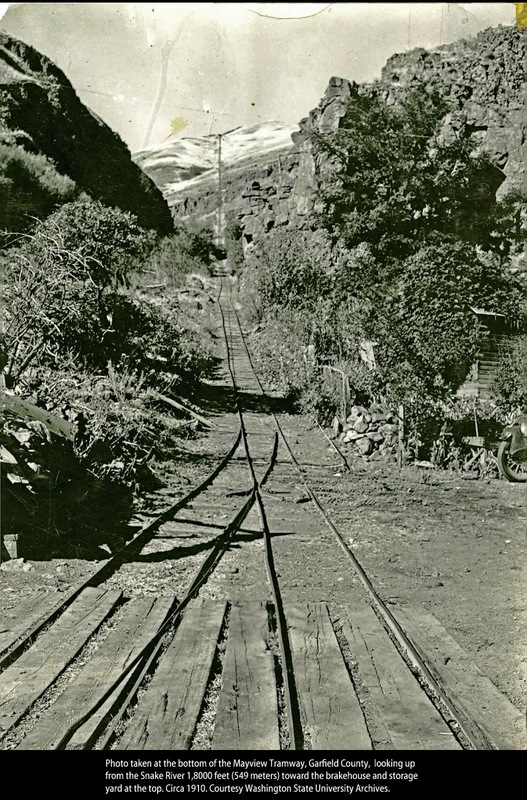 There were two types of tramways installed to gain the River. 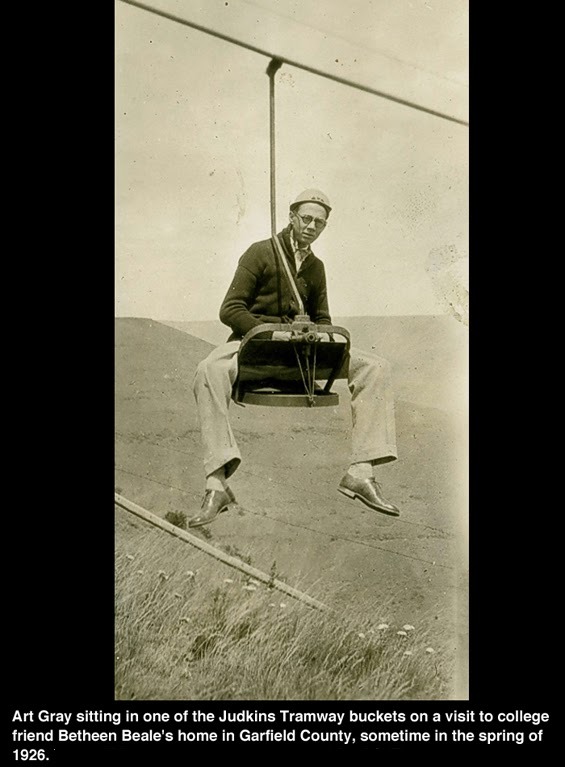 Think of the bucket tramway as being similar to a ski lift. 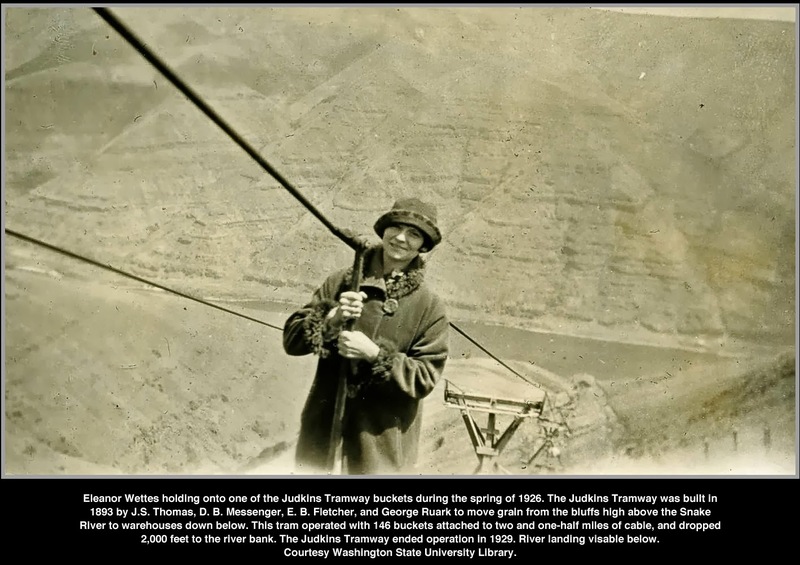 • A mile-long bucket tram was erected at Interior, one mile below Wawawai in Whitman County. 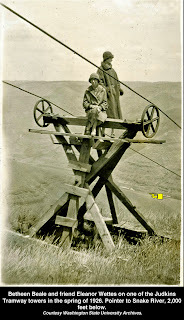 It operated from 1901 until 1938. • Upriver, the Judkins bucket tram, with a 2-1/2-mile-long cable. 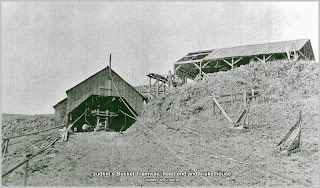 It replaced a grain chute at Kelly Bar in 1893 and continued in service until 1929. The Judkins Bucket Tramway, transported individual sacks, weighting between 110 and 120 pounds (50 to 55 kg.) 2,000 feet (610 meters) from Valentine Ridge down to the Snake River landing. • Here they unloaded the wheat, sack by sack, at a staging area at the top of the tram. Sacks were placed on arm-like metal seats, and like a modern day ski lift, the wheat descended on a heavy cable. 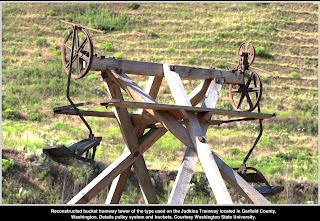 The genius of the bucket tram was in the spacing of the buckets; an equal number of buckets, on the ascent and descent sides of the cable. The weight of the sacks of wheat (approximately 130 pounds each) powered the system! 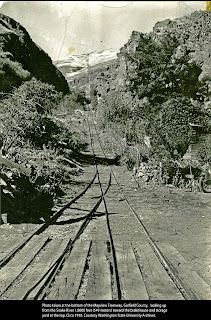 While the bucket tram was a vast improvement over the wooden chute, it was a tedious sack-by-sack descent. The second type of tramway used rail cars. 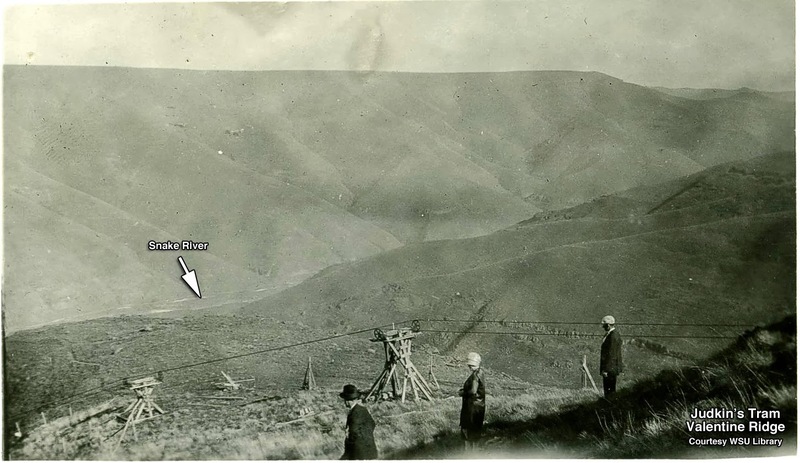 The Mayview Tram was located several miles down stream from Valentine Ridge, at Mayview, Garfield County. Constructed in 1891, he Mayview Tram proved to be the most intricate and long lasting of all. Tram cars rain on wooden rails, topped with an iron strap. 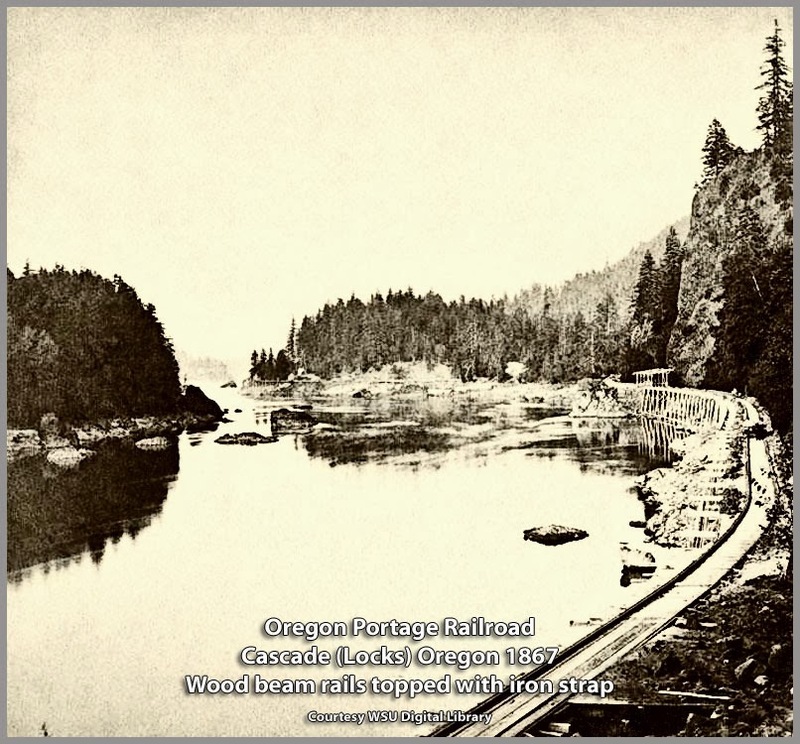 over nearly a half-mile of rails and trestles, for more than a half-century. 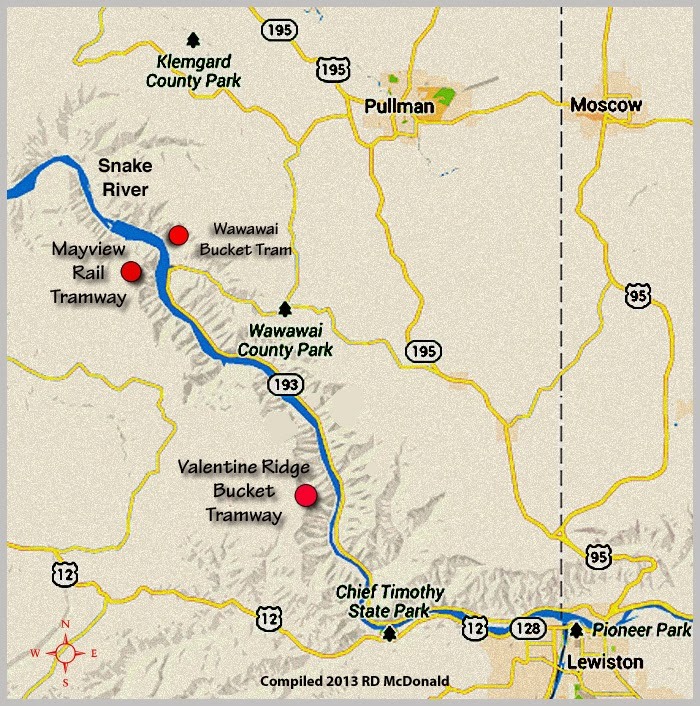 It appears to have been the only rail tram on the Snake River in Washington, but at least one other stood on a tributary in nearby Idaho. 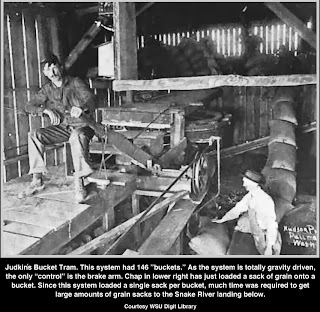 As with the bucket tram, the Mayview Tram was powered by gravity! 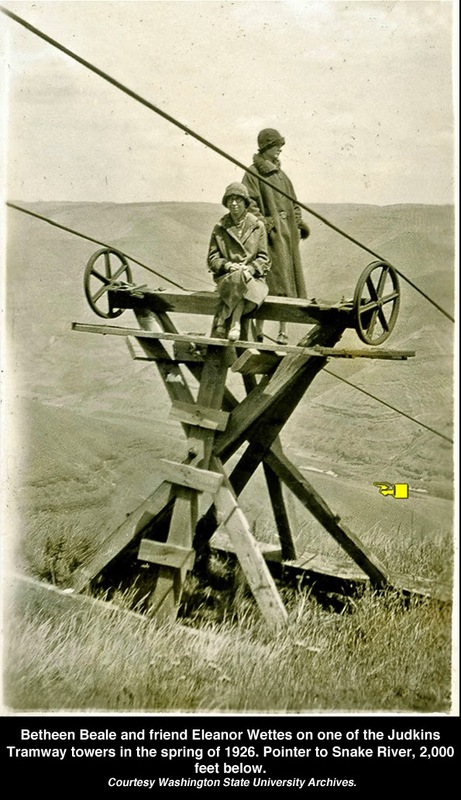 A cable with a car attached to each end, looped over a pulley at the top. Exquisite in its simplicity, requiring only a brakeman to control the system. Workers loaded the upper ear with wheat and, when started downhill; it pulled the empty buggy up. Halfway down, the tracks split so the cars could pass each other. Click to view video of Mayview Tram in action! Clearly, the pioneering farmers who converted the vast Palouse grasslands into the most highly productive acreage in the United States, demonstrated resourcefulness in moving their crops to market. 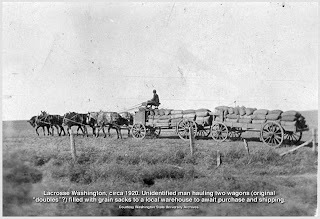 However, the process of transporting grain down to the Snake River landings was painstakingly slow and labor intensive. And they were at the mercy of the "Great Wheat Fleet" to finally reach market. I know a lot about the railroad history of the Palouse region, so I'm looking forward to where this series is going. However, I had no idea about the trams, chutes and cable cars! Very cool to see, thank you so much for the wonderfully detailed research. Exciting detailed history-work intensive. What a way to earn a living. got dizzy looking down at river. 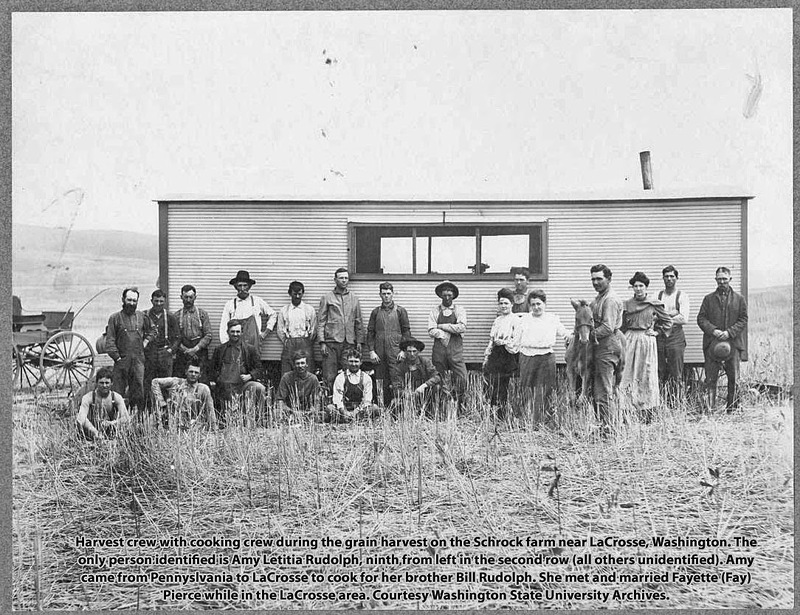 Proud heritage indeed for the Palouse. Thanks for your beautiful pictures and video presentations.